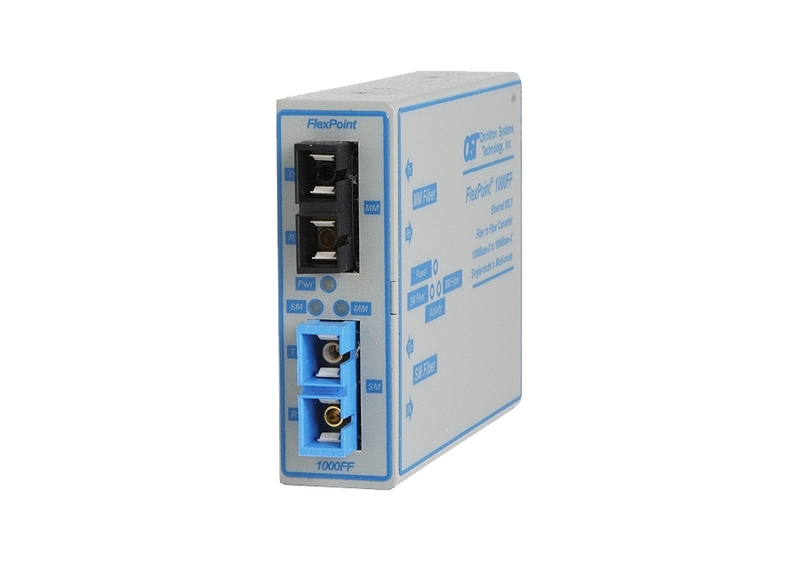 The FlexPoint 1000FF is a protocol-transparent fiber converter that provides reliable and cost-effective extension of network distances by connecting multimode fiber networks or devices over single-mode fiber cabling. No manual configuration is required with the plug-and-play FlexPoint 1000FF. Connect the fiber cables to the appropriate interface and the installation is complete. The FlexPoint 1000FF is a protocol-transparent fiber converter that provides reliable and cost-effective extension of network distances by connecting multimode fiber networks or devices over single-mode fiber cabling. No manual configuration is required with the plug-and-play FlexPoint 1000FF. Connect the fiber cables to the appropriate interface and the installation is complete. The FlexPoint 1000FF is designed to operate with a constant rate signal between 500Mbps to 1250Mbps allowing the converter to be used in Ethernet networks as well as other fiber-to-fiber protocol applications. The fiber port operates at 850nm, 1310nm or 1550nm and features SC connectors. Multimode fiber models support distances of up to 550m, and single-mode fiber models support distances of up to 80km. Descriptions of the LED indicators are provided on the label for easy in-the-field installation and maintenance. The LEDs report the availability of power and the detection of devices attached to the fiber ports. The FlexPoint 1000FF fiber converter can extend the network across single-mode fiber with distances up to 80km. In this application, two Gigabit Ethernet switches are connected utilizing a pair of FlexPoint 1000FF fiber converters, which are connected to the switches via a multimode fiber uplink.